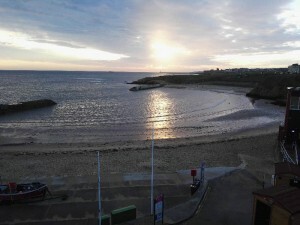 Cullercoats is a great but often unused spot for kayak fishing. It has a very sheltered launch and relatively easy access as long as you can park nearby and can handle the steep concrete road. Once in the water you have a few options. Immediately out of the harbour you have a deep sandy bottom that can produce flat fish most of the year and whiting in the winter. Head south and you have long running reefs that produce pollock and codling. Then you enter Tynemouth Longsands. Further North you have some excellent rough ground between Cullercoats and Whitley Bay. This ground is very rough and has sharp drop off’s. I’ve had a lot of fun fishing for Pollock and Wrasse in this area. You do not need to head out far to find them. Most of my catches have been in only 20ft of water. Cullercoats Bay. A very sheltered launch. The slip is steep but manageable and there is nice reef structure just North and South of the harbour.